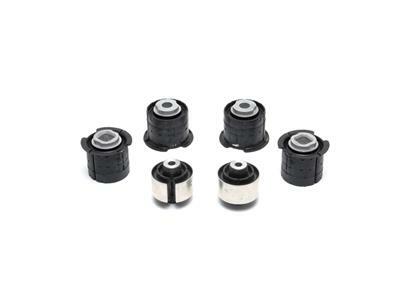 A complete set of stiffer bushings for both the rear subframe and front lower control arms are available. Replacing the excessively compliant stock bushings with stiffer, high performance bushings improves steering response and feel, as well as making handling much more predictable. Cars equipped with larger tires and wheels also benefit from a reduction in the tendency to follow ruts and grooves in uneven pavement.